Lunchbox Dad: Project Mc2 Lunch: The Smartest New Tween Series! If you haven't heard of the new Netflix series Project Mc2, then you and your tween kids need to watch it right now! It is about a group of four super smart teenage girls who just happen to be secret agents. While the series is extremely fun, the main message is that girls can be smart, stylish, and save the world at the same time. The characters excel at math and science, but also are strong enough to take on the super villains of the world. The tagline for the series is "Smart is the New Cool" and it definitely makes that case. My wife and I were initially skeptical because many "tween" shows feature characters that are outdated stereotypes who use cruel language (i.e. stupid, idiot, etc.) to communicate with each other. I was pleasantly surprised not to find any of that with Project Mc2. This series is funny and entertaining without lowering itself for laughs. It empowers girls to be smart, work together as a team, and have fun at the same time. My daughter's favorite character is Adrienne Attoms the culinary chemist, but it's hard not to like each of the girls because of the diversity and talents they each bring to the team. Currently there are only three episodes but my daughter and son were glued to the TV for each of the adventures. However, there is talk from my inside source that there will be more episodes coming soon. 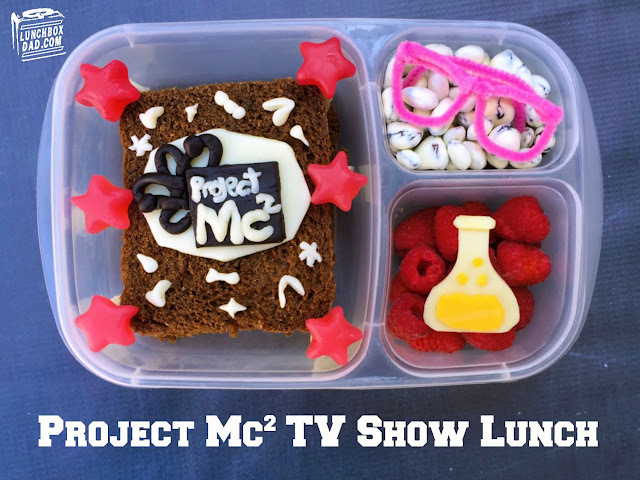 In the meantime there is a fantastic Project Mc2 website with puzzles and games for kids to work on. Not only that, but you can already pick up the new line of dolls at places like Toys R Us or Target. What I love about these dolls is that each one also contains a science experiment that you can do with your child at home. 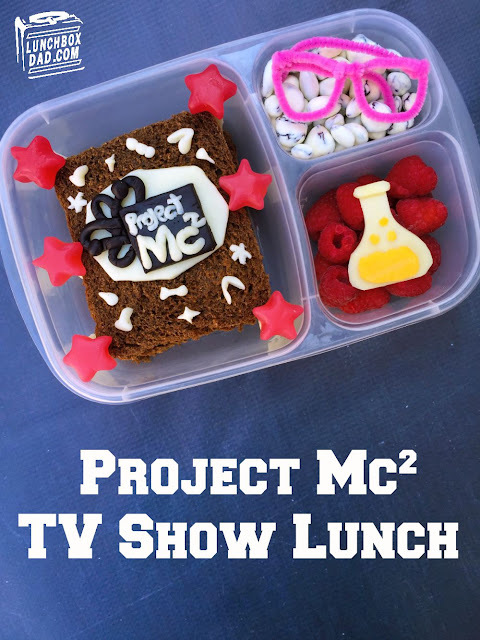 So check out the Project Mc2 trailer below and then make my recipe that includes the famous composition notebook, Adrienne's glasses, and a beaker of course! 1. Cut two pieces of sandwich bread into a rectangle. I used a black bread. Fill with your child's favorite sandwich ingredients. In this sandwich I used nut-free spread and sliced strawberries instead of jam. 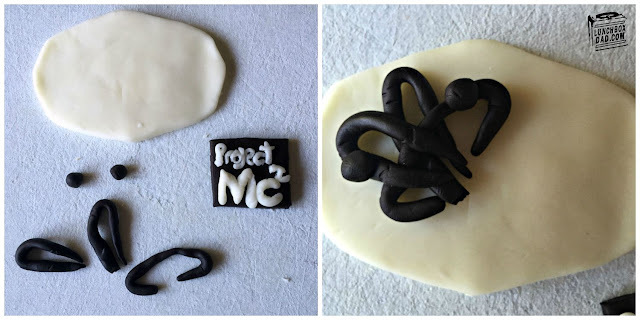 For the notebook label and decorations I used edible modeling dough. Pics of how I did it below. However, if you are in a crunch just search " Project Mc2 notebook picture," print it, cut it out and use that instead. 2. Place notebook sandwich in main dish and surround with natural fruit gummies. 3. Cut a beaker shape out of white cheese. From cheddar cheese, cut a liquid shape with three bubbles. Place these on top of the beaker. Fill a side dish with raspberries and put the beaker on top. 4. Fill a second side dish with yogurt covered raisins. Bend one or two pipe cleaners into the shape of glasses. Don't get too complicated, this should just take a minute. Put on top of raisins. 5. Enjoy the series and the lunch! Disclosure: I am part of the Netflix Stream Team. I was not compensated but I am provided Netflix service and equipment to watch their streaming service. All opinions are solely my own. Just saw BuzzFeed's feature on you. Great job! I love what you've come up with - I do the same thing for my girls and it's so fun. Keep up the great work! Is there a way to subscribe to your blog so i never miss any of your updates and new lunches? This is totally awesome! You're so creative. Way to go Dad!